“I want to be a basketball scout,” you say. To get there though, you have to be more specific. What kind of scout do you want to be? There are different types of scouts and you need to know the difference in order to get going. They come with radically different responsibilities and they require different skills. The most important basketball scouting distinction you need to know about is the one between advance scouts and personnel scouts. There are other categories but they ultimately break down into these two buckets. If you want to start scouting, you need to understand what both types of scouts do and what it takes to be successful in the role you choose. So let’s talk about each of them. We’ll begin with advance scouts. The advance scout studies his or her team’s upcoming opponents. The scout captures these teams’ offenses, defenses, tendencies, and personnel. This job focuses largely on X’s and O’s. When scouting an opponent live, the advance scout must figure out all these aspects virtually simultaneously during the game. And you have to hurry. You need to capture this information and communicate it quickly and effectively to your team’s coaching staff. After all, if the coaches don’t have the info soon enough to use it to prepare, it doesn’t do anyone much good. It often means attending a game that doesn’t end until 10 PM. Then you return to your hotel room to spend the remainder of the night writing a 50 or 60 page report so the coaching staff can review it during their morning meeting. The coaches use this information to build their game plans while you head to the airport for your next flight to a new city. Sound like a tough gig? It is! Because of the strong tactical background the job requires, many advance scouts come from the coaching ranks. It’s hard for someone who’s never coached to have the expertise necessary to do the job well. I’ve never coached and have done a limited amount of advance scouting. If you don’t have a coaching background either, the next type of scouting will be more up your alley. Here’s the type of scouting you’re probably more familiar with. Personnel scouts watch players (personnel) and evaluate their skills. This type of scout tries to figure out what kind of player someone is – to get a feel for that player’s strengths and weaknesses. As a personnel scout, your goals when watching a game can vary. You might look to get a sense of everyone on the court to see if anybody stands out. If you’re not familiar with the players, you probably start here. Or perhaps you are in attendance to to evaluate a specific player. In this situation you might choose to focus exclusively on that one player, tracking him or her wherever he or she goes on the court – and watching the player’s actions and body language off the court, too. “Tunnel vision” is a common name for this scouting technique. It allows for the most comprehensive evaluation of a single player. The personnel scout doesn’t watch the game with an X’s and O’s lens the same way an advance scout does. The focus is exclusively on the player(s), rather than split among strategies and coaches. There’s more than one kind of personnel scout when it comes to the NBA. College scouts watch college players in the United States to determine how those players might perform in the NBA in the future. International scouts have similar goals but work on the international stage. They travel the world in search of talent. If you’ve always dreamed of attending a game with attendance 14 in a rural town in Estonia to watch a 16 year old, this job might be for you. Pro personnel scouts evaluate NBA and G-League players. Their work allows their team’s front office to stay up to date on who might be of interest to them going forward. For free agent signings and trades, reports from pro personnel scouts can prove invaluable. Though the two roles share similarities, they come with their own unique challenges. Let’s go over the differences. 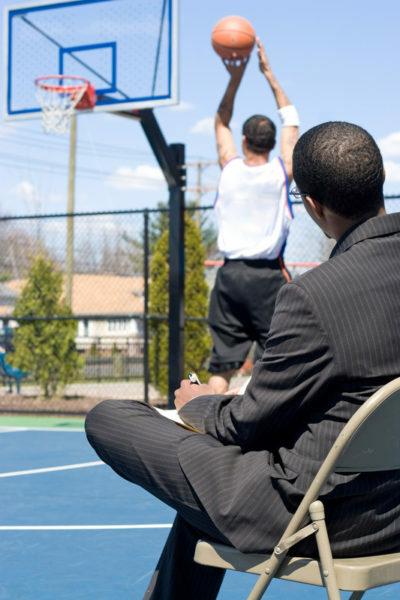 The advance scout often has direct communication with his or her team’s coaching staff. He adds immediate value to the team on the court. The personnel scout works and lives on more of an island. The value of his or her work takes time to fully reveal itself. Working as a personnel scout presents political concerns that maybe don’t exist for an advance scout. An advance scout delivers accurate, actionable information to his or her team’s coaching staff. This responsibility includes a specific goal on which a scout can be evaluated: Is the advance scout’s work helping the coaches and the team prepare for games? Because the personnel scout exists more in isolation from the rest of the organization, there’s less potential for oversight and accountability. There are a few key reasons at play. Advance scouting provides more concrete, immediate intel than personnel scouting. Either a team runs a lot of Horns sets or they don’t. If you get it wrong, you find out in a few days. But whether an undersized college guard prospect has a floater he can convert consistently in the NBA – that depends on a number of factors. Any conclusion you draw is an educated guess. It can take years to know if you got it right or wrong. You might never find out. Putting a player’s athleticism and potential in context is hard. Many teams divide scouting responsibilities, often geographically. This division of labor means that unlike an advance scout, whose work serves as a preview to what the coaching staff sees, a personnel scout often forgoes second opinions. His bosses just have to take his word for it because they haven’t been on the road scouting the player themselves. Supervision can work the other way, too. Suppose a personnel scout likes a prospect. In this case, he knows his general manager has not only scouted this player, but also holds a strong negative opinion about the prospect. The scout might feel hesitant to share his true feelings for fear of looking bad or offending his general manager. I empathize more with the plight of the personnel scout because my experience lies in that area. When I worked as a high school basketball scout, I had days where I watched parts of 20 or 30 games without seeing any prospect who might be of interest to a college coach I knew. I had to keep working and watching closely in case I saw a glimpse of something special. I had similar experiences with regional NBA scouting. It is a grind. It’s hard to evaluate whether your work is on point. You have to be skeptical about what you’re watching. When it comes to the lifestyle, regardless of your scouting role, you’d better be ready to become an expert traveler. You won’t be around the team much because you will be on the road all the time traveling on a budget. An airplane seat will frequently be your bed. “Day off” isn’t in your vocabulary during the season. What background and strengths do I bring to the table? Do I come from a coaching background? Which area of the game am I most interested in? What do I feel drawn toward? Is it X’s and O’s? Which role fits my personality and the way I work best? What opportunities are available to me right now that could help me improve my skills related to scouting? Do I want to scout at all? Whichever basketball scouting path you choose, hard work and a brutal lifestyle awaits. You’ll need good scouting habits to succeed. If you don’t have passion for that facet of basketball, you won’t be able to succeed. And now that you know the two types of scouts, you can start thinking about what might come next for you. Which of the two types of scouts best fits your mindset? How important is it for a scout to have knowledge of the Collective Bargaining Agreement to present another light into Scouting? “For a scout” — I’d say not important. A scout’s value is in scouting. For a person who wants to work in a front office, CBA knowledge is great. If you also have scouting ability and experience, then you bring extra value to the front office. There are valuable people in front offices who do both things well. How can a home personnel scout receive immediate assignment to start breaking down video. Synergy Sports uses loggers to break down video. You might start by looking for work with them. For work with a team, it comes down to building relationships and trust to gain an opportunity.